Bones are the building blocks of our bodies. They are hard, yet flexible, and consist of collagen, calcium-phosphate mineral compounds, and living cells that regenerate constantly. New bone cells are formed, as the old ones die off. In children and teens, bone cells grow at a more rapid rate than they are lost. At this young age, your body is achieving its "peak bone mass," or densest, healthiest amount of bone during your lifespan. According to the National Osteoporosis Foundation, the more bone you have between the ages of 18 to 25, the less likely you are to suffer from a broken bone or osteoporosis later on. Osteoporosis occurs when you lose too much bone, or make too little, leading to fragile bones susceptible to breaks. As you grow older, your body loses more bone than is formed. This usually happens around midlife, for both men and women. In women, bone loss increases greatly following menopause. It is important to support your bone health and strength as you age with proper diet, calcium and Vitamin D supplements, as well as exercise. There are 26 bones in the foot. 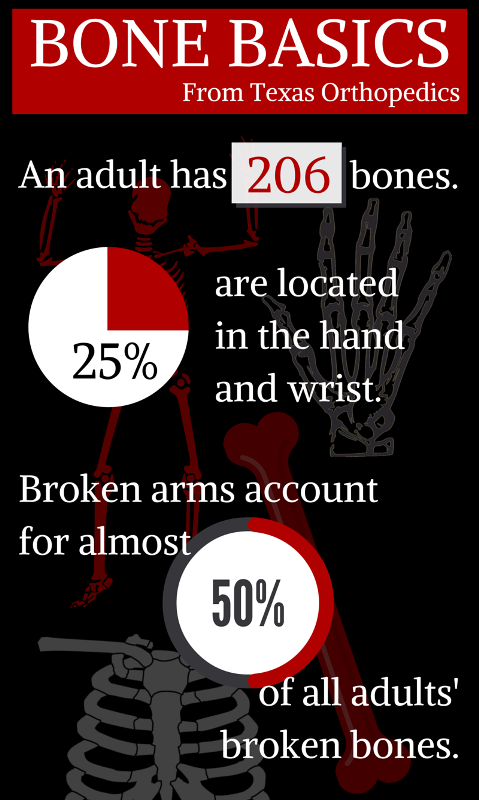 There are 54 bones in the human hand, including the wrist. The femur, or thighbone, is the longest and strongest bone in the body. The stapes, in the middle ear, is the smallest and lightest bone in the body. 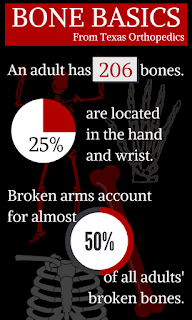 Broken arms account for almost half of all adults' broken bones. The collarbone is the most commonly broken bone in children. Bones cease growing in length during puberty. The hyoid, a bone located at the base of the tongue, is the only bone in the human body not connected to another bone. Bones protect organs from impact damage. Chances are you know someone, young or old, living with arthritis. Arthritis affects more than 50 million Americans. One in every five adults and 300,000 children live with the debilitating condition that causes joint pain, stiffness, immobility and swelling. Myth #1: Arthritis aches and pains just come with getting older. Fact: People of all ages, races, and genders suffer from arthritis. Two-thirds of those with arthritis are under the age of 65, including 300,000 children. Myth #2: Arthritis is not considered a serious health concern. 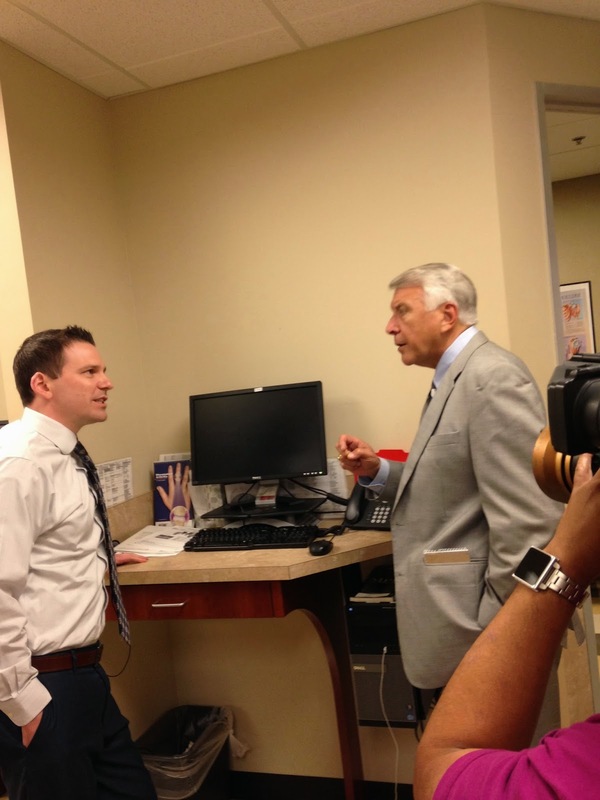 Fact: People with arthritis log 44 million outpatient visits and account for 992,100 hospitalizations each year. The disease is a more common cause for limited physical activity than heart disease, cancer or diabetes, and is expected to affect more than 67 million Americans by the year 2030. Myth #3: Arthritis patients should avoid exercising. Fact: Endurance and resistance types of exercise offer unique benefits for people with osteoarthritis (OA) and rheumatic conditions, according to the U.S. Department of Health and Human Services. Regular exercise helps maintain a healthy weight, and a healthy weight greatly reduces pressure on the joints frequently affected by arthritis, such as the knees. Myth #4: Not much is being done to advance a cure or treatments for arthritis. Fact: Medical groups around the world are dedicated to arthritis research and developing better treatment options while hunting for a cure. Special organizations are also focused on raising awareness of the disease and its issues at the local level and in Washington, D.C. to generate more funds and assistance for research. 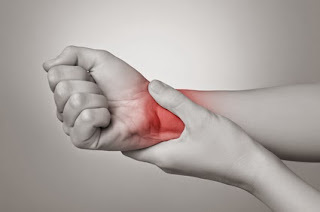 Are you suffering through joint pain? Don't. Make an appointment with a Texas Orthopedics specialists to find out the source of your aches and pains. We see many young Central Texas athletes at our clinics for injuries caused on the playing field. 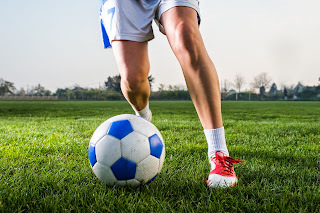 Recently, it has been a growing number of female athletes with the same injury - a torn ACL. The rise of ACL injuries among females is not uncommon. 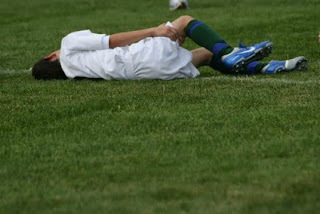 In fact, girls are 8 to 10 times more likely than boys to tear an ACL. Prevention is key. 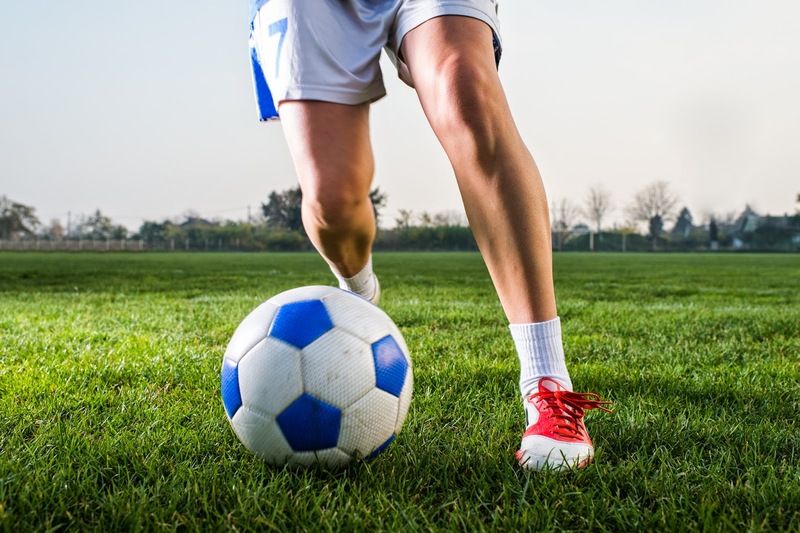 According to the American Academy of Pediatrics, specific types of physical training can reduce the risk of ACL injury by as much as 72%, especially in young women. That's why Texas Orthopedics became a Certified Clinical Site for the nationally acclaimed Sportsmetrics program for preventing ACL injury. We'll be launching our first ACL Injury Prevention Camp this summer. Contact us for more information or to register at 512-439-1935 or email sportsmetrics@txortho.com. All athletes will have their progress charted in a training log and receive a Sports Injury Test Report pre- and post-training. During the 2013-2014 academic year, high school athletes suffered more than 300,000 lower-limb injuries requiring medical attention and suspension of play for at least one day (according to the Colorado School of Public Health Pediatric Injury Prevention, Education and Research Program). 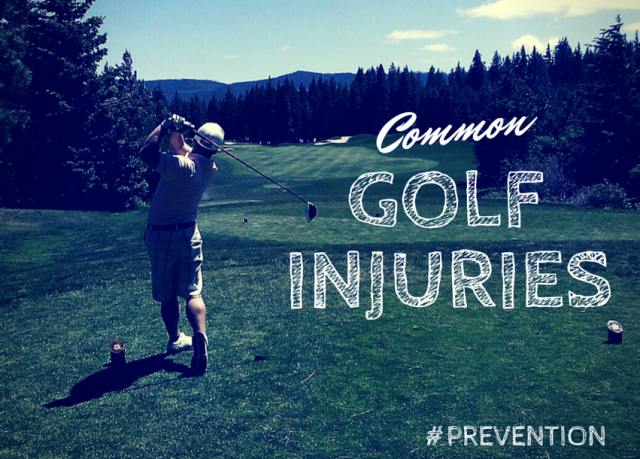 Yet a recent study published in the Journal of Science and Medicine in Sport claims that only a mere 10 percent of high school coaches have adopted Injury Prevention Programs (IPP) to reduce these types of injuries. A solid IPP might include 15 to 20 minutes of stretching and strengthening exercises for hips, legs and thighs, along with jump-training to practice soft landings and minimize impact to the knees. The exercises are meant to be done three to four times a week before a practice or games. This recent study involved 66 head coaches of basketball and soccer teams at 15 different high schools in Oregon. The online survey gauged their knowledge, attitude, and behavior regarding IPPs. 14 coaches reported using one of the IPPs, with six claiming they implemented the IPP exactlly as designed. Coaches of girls' teams reported to be more aware of IPPs than coaches of boys' teams. Coaches who did not use an IPP said the programs offered no advantage to their current training methods, were not compatible with their needs, or seemed difficult to implement. Most exercises in an IPP have been developed to decrease serious injuries like ACL/Anterior Cruciate Ligament tears, but they are also helpful in reducing more common ones such as sprains and muscle strains. Coaches interested in implementing an IPP for their team are encouraged to check with health care providers, such as orthopedic specialists, to learn about what type of program would most benefit their young athletes. It is well known that regular exercise contributes to a longer, healthier life. But how much exercise is enough? Does doing the bare minimum, 150 minutes weekly, according to medical industry guidelines, still help? And, what about if you do more than the minimum? Two recent studies published in the JAMA Internal Medicine (The Journal of the American Medical Association) tackled these questions. The first and more comprehensive of the studies was conducted mainly by the National Cancer Institute and Harvard University. They reviewed data on exercise habits from more than 661,000 adults over the course of 14 years. Subjects were grouped by their weekly exercise times, ranging from those who did not exercise at all to those who worked out 10 times more than the recommended amount. Those who did not exercise at all were the highest risk of an early death. Those who met 150 minutes of weekly moderate exercise achieved greater 'longer life' benefits and were 31% less likely to die during the 14 year study than those who did not exercise. Those who did triple the amount of exercise, working out for at least 450 minutes per week, were 39% less likely to die early than people who never exercised. 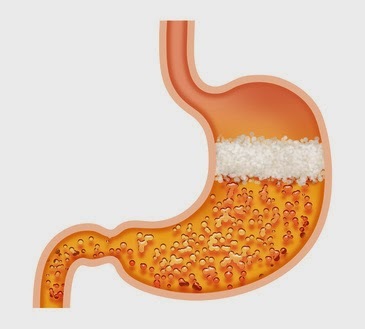 The second study out of Australia yielded similar results. Data from more than 200,000 adults was analyzed with regard to time spent exercising and how much of that exercise was considered vigorous, such as running versus walking. Like the first study, they checked mortality rates and found that meeting the recommended amount of weekly exercise greatly reduced the risk of an early death. 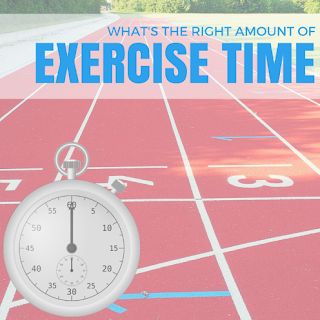 Bottom line... everyone should aim for at least 150 minutes of exercise per week. It will be life changing.